The 9th annual Iowa Statewide Veterans Conference was held at Upper Iowa University’s Fayette Campus Monday, September 24. Hosted by Iowa’s Advisory Council on Military Education (ACME), the event included guest speakers, networking opportunities and a resource fair. In addition to UIU, representatives from Iowa’s three regent universities, Iowa National Guard, Home Base Iowa, and various other military support organizations, community colleges and private universities were in attendance. Keynote speaker Christopher Pascale discussed his transitional pathway after military service to those attending the recent Iowa Statewide Veterans Conference at Upper Iowa University’s Fayette Campus. Pascale is a 2011 UIU graduate, former Marine combat engineer, and author. Evaluating and restructuring policies related to acceptance and transfer of credit for veterans, military students and their adult family members. Making educational programs accessible in cost, location and scheduling. 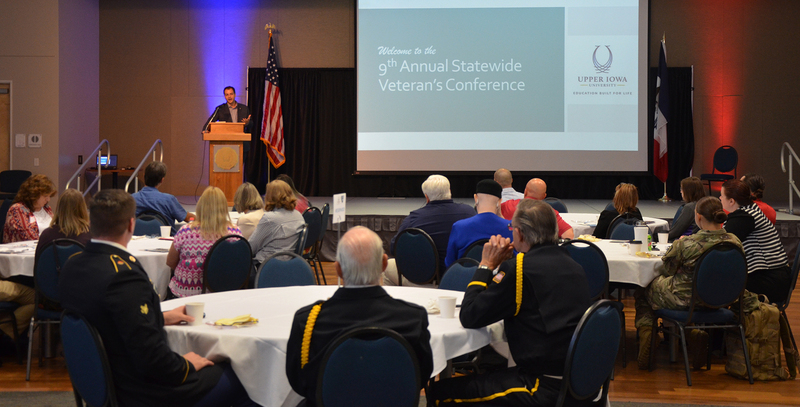 UIU was the first private university to host the annual Iowa Statewide Veterans Conference. UIU is also a proud participating institution in the Principles of Excellence and Yellow Ribbon programs, having been repeatedly named a top Military-Friendly University by Military Advanced Education & Transition and Viqtory Media. The University offers a wide variety of educational opportunities tailored to fit the dynamic lifestyle of today’s military personnel and their families. Located at Fayette Campus, the UIU Military and Veterans Service Center (MVSC) provides a relaxing physical space for veterans and military-affiliated students to study and connect with other students. Assistance is available to students and the University’s total military family who need help navigating all of UIU’s resources. In addition, Upper Iowa is a member of the PAVE (Peer Advisors for Veteran Education) network. Headquartered at University of Michigan Medical School, PAVE is a peer support program that connects incoming student veterans with student veterans already on campus in order to help them navigate college life, identify challenges they face, refer them to appropriate resources on or off campus, and provide additional ongoing support.